The Beagle LabVIEW Driver is a free and open-source LabVIEW Instrument Driver for the Beagle Protocol Analyzers. This version supports LabVIEW 2017 and above. If you are using an older version of LabVIEW (version 2016 and below), please check the Archived Downloads page (please note, you must be logged in for this link to work). If you do not see the version/device driver you require, please submit a support request. The Beagle LabVIEW Driver is a free and open-source LabVIEW Instrument Driver for accessing the Beagle I2C/SPI Protocol Analyzer and the Beagle USB 12 Protocol Analyzer within the LabVIEW development environment. The driver bundle is targeted for Windows. This driver is based on the Beagle software library and provides all of the functions ordinarily available to a C language developer. Detailed documentation on the functionality of the Beagle API can be found in the Beagle user manual. 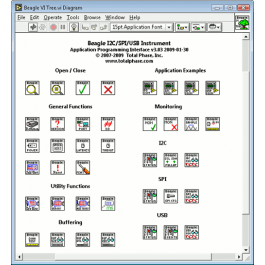 The Beagle LabVIEW Driver is provided as a courtesy for Total Phase customers. While it has been verified to be complete and functional, detailed support on the Beagle LabVIEW driver will not be provided by Total Phase. With that said, any developer familiar with LabVIEW will find that the Beagle LabVIEW Driver is quite easy to integrate into a LabVIEW design. In addition, the driver can be modified by end-users to create any potential customizations. LabVIEW example that demonstrates how to connect to a Beagle analyzer.